Mark Twain once said, “All things are mortal but the Jew; all other forces pass, but he remains.” It’s true that for over 6000 years, we’ve managed to survive many atrocities, and yet the Jewish people continue to thrive. But can we make it another 1000 years? Futurama seems to think so. The animated sitcom pokes fun at a lot of different things, but Jewish religion and culture come up quite a lot. We can probably thank David X. Cohen and his hilarious team of writers for that. However, we think the Jewish jokes are in there for more than just a couple cheap laughs. In fact we think Futurama, which takes place in year 3000, envisions an optimistic future for Judaism. In honor of Futurama‘s 20th anniversary, we’ve highlighted 5 aspects from the show that not only prove that Judaism will still around in the future, but also Jewish culture will continue its influence on the world… or in this case, the universe. 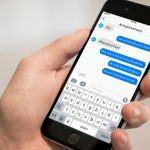 We don’t learn much else about this group of religious robots, other than they don’t believe in Robot Jesus (although they believe he was a very well-programmed robot). 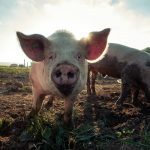 Also they don’t allow shellfish or pigs to attend the party. 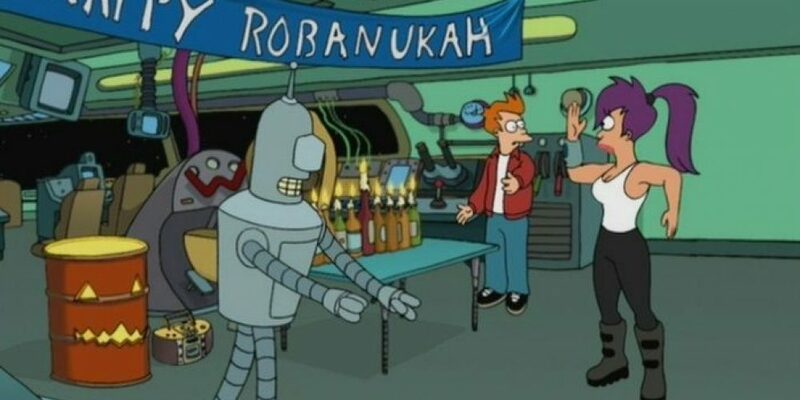 Later on, in “The Futurama Holiday Spectacular,” the robot Bender celebrates Robanukah, a six-week holiday that is totally not an excuse to get out of work. Traditions include watching two female robots wrestle in oil, and playing with an automated dreidel (“droid-el”) that forces you to pay up. 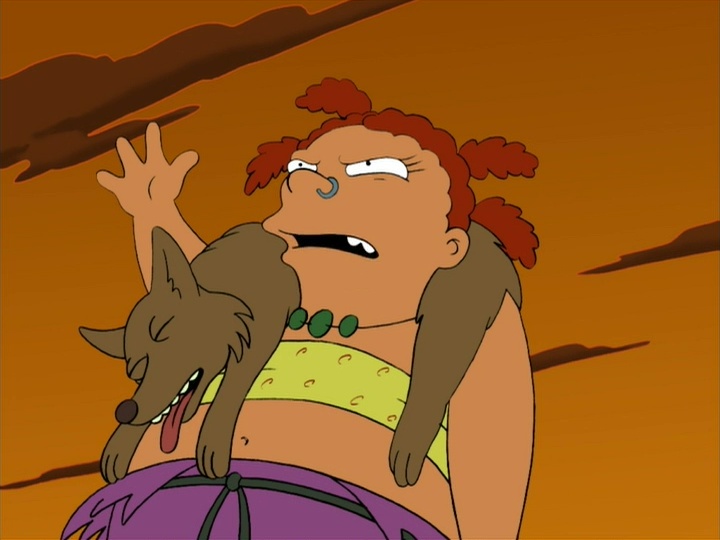 In the episode “The Cryonic Woman,” Fry finds himself stuck in a post-apocalyptic wasteland in the year 4000, in a society run by feral children. He challenges their leader’s authority by participating in a death-rolling race (it’s like skateboarding but safer). It turns out that Fry did not land in the year 4000 at all. Instead, he was transported to the year 3000’s Los Angeles. Furthermore, this episode proves that Los Angeles will forever be a barren wasteland. In the movie Bender’s Big Score, the people of Earth assemble a fleet to fight against alien scammers, with the aid of Robot Santa, Kwanzaabot, and Chanukah Zombie. Odd that this group has two robots and a zombie, right? Once again, there is more to this joke than meets the eye. Zombies are very much like golems, both mythical anthropomorphic beings. Neither one are very bright, can talk well, or are completely human. The most famous golem was created to defend the Jews of Prague in the 16th century. Likewise, the Chanukah Zombie exists to defend the people of the 31st century. 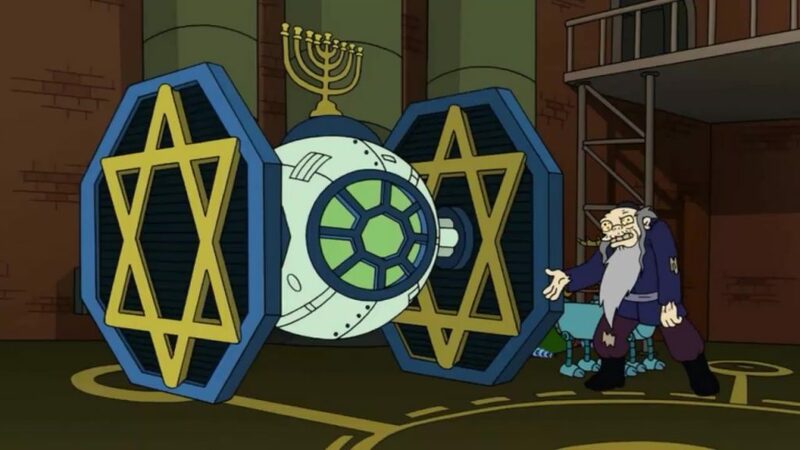 He spins a dreidel made of C-4, and he flies around in a Jewish-themed TIE fighter (it helps that he’s voiced by Mark Hamill). Also he carries a pretty good tune. Golems have often been compared to robots, as they both function to serve human beings. Therefore, the Chanukah Zombie is a bit of a Jewish robot himself! In “Fry and the Slurm Factory,” the Planet Express crew visits the planet where they make Slurm, an intergalactic fluorescent green beverage. Naturally at the end of the tour, they end up in in a gift shop full of Slurm-branded shirts, mugs, and glassware. For those who are not in on the joke, this is making fun of the Coca-Cola shirts you can find all over Israel, such as Machane Yehuda Market in Jerusalem and Carmel Market in Tel Aviv. If you don’t come home with a Coke shirt in Hebrew, did you really go to Israel at all? This is one of our favorite jokes in the entire show for how obscure the reference is. 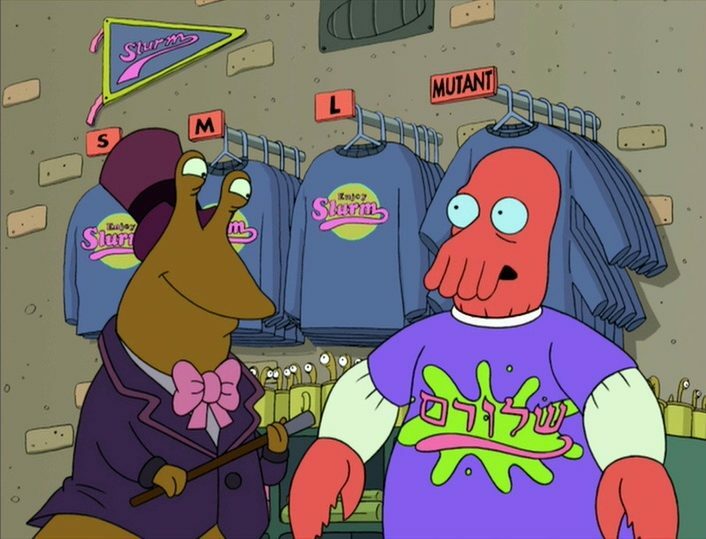 But it makes us think that if they are selling a shirt in Hebrew at the official Slurm gift shop, the beverage must be popular among Hebrew-speaking people. Thus it must be popular among Jews. Therefore, Slurm is probably kosher, and it might pair well with some falafel and pita. Finally we must discuss the crustacean in the room: Dr. John A. Zoidberg. Zoidberg is the resident doctor of Planet Express. 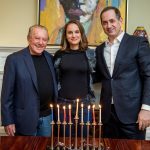 He speaks with a strong Yiddish accent. He even has an uncle in showbusiness. As Heeb Magazine puts it, he is both the show’s schlemiel and schlimazel. 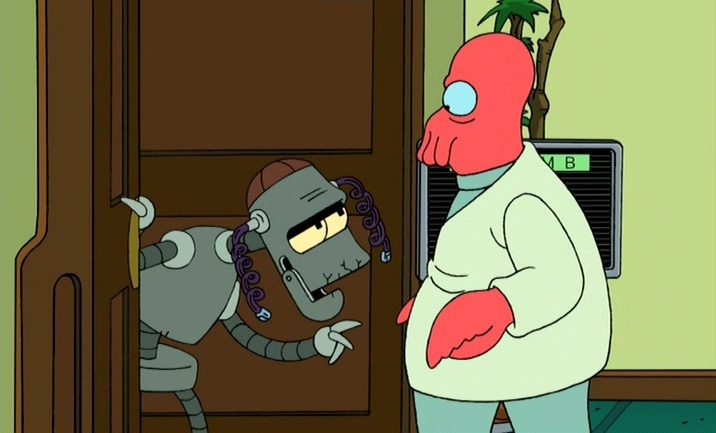 The question fans have debated for years: is Zoidberg Jewish? Though much of his personality points to “yes,” we are hesitant to say so. Zoidberg is socially awkward, cowardly, unhygienic, and terrible at his job. Not exactly the kind of traits that make us want him to represent the Jews of the future. On the show, Zoidberg never once mentions he is Jewish. He doesn’t go synagogue or study Torah. And he’s not even allowed at bot mitzvahs. According to his voice actor Billy West, his accent is based on Jewish comedians’ George Jessel and Lou Jacobi. And in the episode “Why Must I Be a Crustacean in Love?” where we meet the rest of his species, we discover that many Decapodians carry a similar accent. Rather than outright say the Decapodians are Jewish, we think they were inspired by Jewish culture, particularly that of the borscht belt era. Perhaps one of their ancestors got hold of a Jackie Mason tape and the species evolved from there. It’s not the most important aspect of Jewish culture, but it is nonetheless a memorable part. 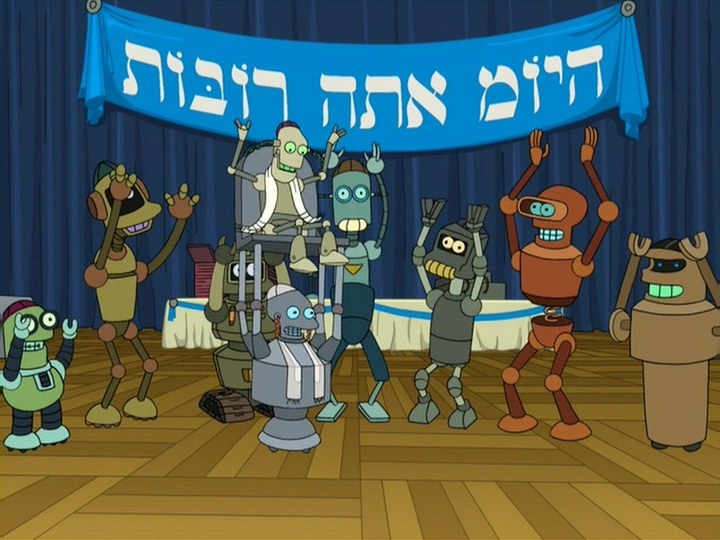 And in 1000 years, Futurama proves we all still have Judaism. 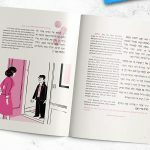 There was one more Jewish moment we wanted to write about, but we couldn’t find a way to weave it into the article. French is a dead language in the Futurama world, so how would Zoidberg know to say this? Turns out this is a reference to an open letter written by Émile Zola, who accused the French government of anti-Semitism as a result of the Dreyfus affair. Captain Alfred Dreyfus was a Jewish officer who had been framed for espionage, and he was chosen as the scapegoat mainly because he was Jewish. This one-second joke is more subtle than the Slurm one! Y’asher koach to Chanukah Zombie at the Planet Express Employee Lounge for figuring this one out.